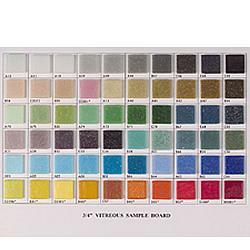 FULL COLOR SAMPLE BOARD OF OUR MILLENIUM VITREOUS TILE. SAMPLEBOARD IS DONE IN 3/4" TILE SHOWING ALL COLORS AVAILABLE IN BOTH 3/8" AND 3/4" SIZES. Why I love Maryland Mosaics!